It is now becoming much cheaper to own than to rent in many markets. 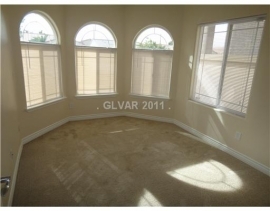 Anyone renting by choice in the Las Vegas area is a fool. 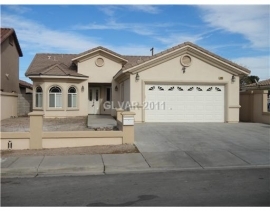 Today's featured property is a Henderson, Nevada, property with a cost of ownership much lower than a comparable rental. So much cheaper to own that properties like these make great investments. During the housing bubble prices rose to levels where owning cost twice as much as renting in many California markets. As many predicted, the deflation of the bubble is causing markets to overshoot fundamental valuations to the downside — including many here in California. It is cheaper to buy a two-bedroom home than rent one in 72% of major metropolitan areas around the U.S., according to the Trulia rent vs. buy index released Monday. The real estate data firm said increased demand for rental properties is driving the cost of homeownership down nationwide. Trulia compared the median list price of a two-bedroom home with the median price paid for rent in 50 cities. The company then assigned a price-to-rent ratio to each city, with any number below 15 signifying a homebuyer's market and any number above 21 signifying a renter's market. Any market between those two numbers has more balanced rent versus buy costs. The cost of homeownership includes mortgage principal and interest, closing costs, property taxes, hazard insurance and homeowner association dues. It excludes all maintenance, bills, and security costs. The cost of renting a unit includes rent and insurance. Among the most affordable housing markets are Miami and Las Vegas, both of which have a price-to-rent ratio of 6 and where foreclosure rates have been the highest in recent years. Miami posted the highest number of foreclosures in the third quarter, according to RealtyTrac. Filings were up 9% from 2009 to about 58,600. RealtyTrac reported that Las Vegas had the highest rate of foreclosure in the third quarter, when one in every 25 housing units received a foreclosure filing. Trulia reported that it is cheaper to buy than rent in several Texas cities, including Arlington, San Antonio and El Paso. The foreclosure rate in Texas dropped to 1.82% in the third quarter from 1.95%, according to the Texas Mortgage Bankers Association. During the third quarter, the national average home foreclosure rate was 4.39%. The Trulia rent vs. buy index found that it is cheaper to rent than buy in only 8% of markets, including New York, Seattle, Kansas City, Mo. ; and San Francisco. The price-to-rent ratios in these cities were 31, 24, 21, and 21, respectively. In the remaining cities tracked by Trulia, the study found that buying may be a financially sound long-term option despite the affordability of renting in those markets. For a complete list of housing markets in the order they rank in homebuyer affordability compared to renter affordability, click here. Trulia is a San Francisco-based real estate data network with a searchable database of listed homes. The firm recently acquired Movity, a real estate data firm that specializes in geographical reporting. What kind of property is cheaper to own than to rent? MOVE IN READY! Not a Short Sale or REO. Quick response from seller. Newly rehabbed home, all new paint inside this single story custom home in Henderson, has 3 bedrooms and 2 full bathrooms, lots of upgrades in this home. If you are looking for a reasonably priced home for your clients with no HOA Dues; you have found it. What is the comp value? That question is more difficult for this property than others because it was one of about a dozen properties built in 2006 and 2007 as infill in the older neighborhood. When you look at the neighborhood comps, you see many at $80,000 to $90,000, but the new stuff is all selling in a tight range at $113,000. I originally purchased this property to resell as a rental. Rental comps suggest it would rent for $1,100 to $1,150. 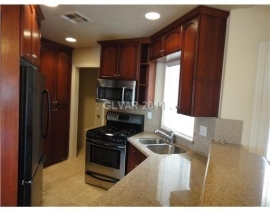 A cash buyer for this property would receive a 6.4% return on their money. A financed buyer using a 30-year fixed-rate mortgage would be cashflow positive with 20% down and earn a 17.9% return on the down payment investment. When I measure the rate of return, I include both the excess monthly cashflow and the equity hidden in the loan repayment. Also, I only consider the current cashflow. I can make the case that properties trading at mid 90s prices are due for a bounce back, but with the overhead supply, any rebound won't be for many years. This is an investment you take because you want current cashflow with long-term asset preservation. The resale value of this property may go down for a year or two, but with cheap and stable financing, there is no reason to sell while values are depressed. There is also the very real possibility that people buying for positive cashflow will create a durable bottom and values may not decline much further on these properties. Personally, I think the under $150K market in Las Vegas is solid, but then again, i am selling a property in that price range, so take my opinion for what it is worth. I am not a seller because I don't believe in the product. I am a seller because flipping is my business. I have been very blessed to find the right person to run my fund's operations in Las Vegas, Jackie Evans. Jacki was recommended by my wife who knew her years ago. Jacki has always been a very hard worker, and as circumstance would have it, she was ready to make a move from the mortgage side of the industry. Her experience as a lender processing hundreds of loans gives her the organizational skills and real estate background necessary to manage the purchase-to-sell process. Her performance to date has been outstanding, and I am becoming increasingly comfortable delegating important tasks in the process.The renovation of this property was entirely done by her. I never stepped foot on this property. I didn't have to. I think she is doing a great job, so today, we are showing her off. When I bought this property at auction, I knew the property was only a few years old, and it had a great kitchen and tile in the main areas. I wasn't planning to repaint despite the garish yellow color. After some discussion, and an eager contractor offering a very good deal, we decided to repaint with a more neutral color. Perhaps my plain vanilla tastes are showing, but I prefer the new look. When the fund I operate is fully deployed, I purchase rental propoerties all-cash for other investors. One one of these deals, when we went to negotiate cash-for-keys, the occupant was a holdover tenant who wanted to stay. Since we didn't have to pay to get an owner to leave, renovate the property and find a renter, a significant up-front investment was eliminated. The rate of return went from about 9% to nearly 13%. That was a success. This property was not. The owners of this property were beligerent, destitute and well educated on the cash-for-keys game. The owners told us we needed to give them $4,000 or they would rip out the cabinets, counter tops, appliances, light fixtures, celing fans, toilets, tubs, you name it, they were going to take it or destroy it. A scorched earth policy. When we asked them if they realized what they were saying to us was illegal. The personal property was theirs, but the items afixed to the real estate was mine. They replied that they didn't care. They didn't have anything of value to take if we sued them; after all, they just lost their house. I didn't call their bluff. It wasn't worth it. I wrote them a big check — not $4,000 but big enough — they left everything in place, and I had possession a few days later. Usually, I don't roll over that easy, but given the circumstances, I think it was the right call. I do have some middle-class squatters in two of my properties that I wil gleefully kick to the curb after they have exhausted their legal remedies in the eviction process. After two and a half years of free living on the bank, they want two or three more months on me. I am not the only one in this business who has seen shady stuff. Aaron Norris stopped by last year and commented on people drafting fake leases to get cash for keys. I had that on a recent property too. When I prepared this post, I was hoping to solicit some buyer interest. Late Friday evening I get a call that an offer for $114,100 was presented to us. I have decided to take that offer (it is FHA, so it doesn't pencil to full asking). Any of you interested in cashflow properties like this one. keep watching these weekend posts. I will display more here. This entry was posted in News on February 12, 2011 by IrvineRenter. This house linked to above was sold in 1991 for 77,950. The resale value of that property in 2011 is less than its 1991 sale price. 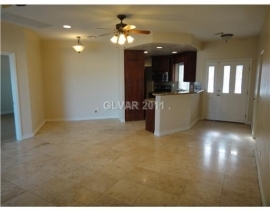 Wouldn’t this drastic inequity between rent/own indicate that rents are still dropping in Vegas? If you’re flipping these properties to other investors, you aren’t concerned with that medium/long-term outlook, but your buyers should be. It’s either that or an indication that house prices are poised to rebound aggressively, but I don’t think anyone’s gutsy enough to make that prediction about the Vegas housing market. After all, if we use inflated housing prices v. rents/wages as an indicator that prices will fall (or that rents/wages will rise), shouldn’t it also work the other way around? 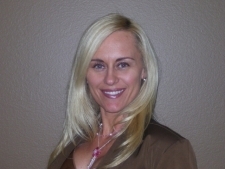 Do you have someone similar to Jackie Evans in the Phoenix area that you trust and can recommend? Thanks.